The library is always adding new cookbooks both the to adult and kids’ section. 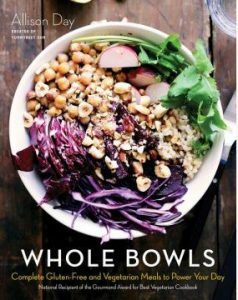 I thought that this one was terrific as it is filled with so many refreshing whole food recipes. So far I’ve tried the yogurt bowl with roasted oats and cherry pesto (amazing), the cauliflower tofu curry (fast, easy and savory), the miso meal (wonderfully flavored broth) and the desert chickpea cookie dough dip (very yummy on apple slices or just rolled into balls). Ingredients are pretty basic and have been easy to source and the recipes are largely vegan or simple enough to veganize so that works well for us. Can’t wait to make the gorgeous bowl on the cover and many others.